" The torturers brought one more victim to the room they dare not enter alone. 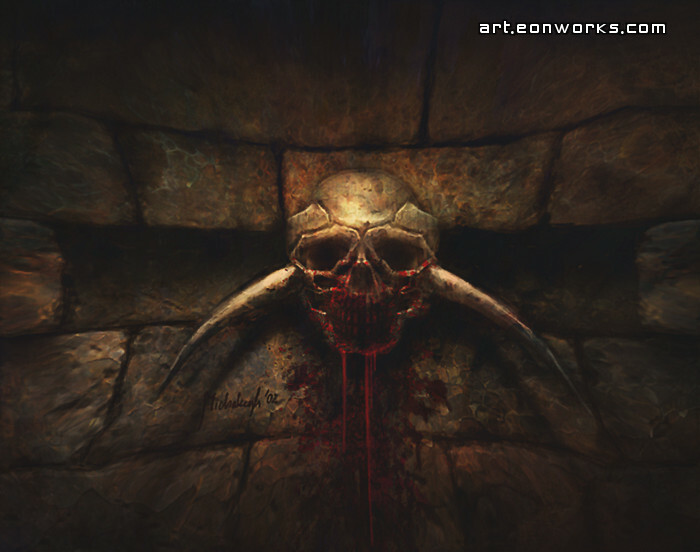 Legend said the skull upon the wall was a heretic long past, from the days of the original Inquisition. Yet none explained the horns that grew from the ancient bone, or the disappearances of subjects left untended. The pragmatic said that rats ate the abandoned souls left to rot after their confessions were extracted, and scattered the bones among the piles that littered the stone floor. There was no one to clean them up, the superstitious would not enter the room saved for these special cases, not until long after. But this time, a pair of brothers had been taken. Confession had been wrung out from one the day before. The torturers expected to find his putrid corpse still bleeding upon the stone slab on which he had been chained and tortured to the brink of death. But all they found was blood, a little dried where the chains had bound the unfortunate man, yet still dripping wet from the mouth of the inanimate skull on the wall. " it looks really cool. it looks like stone staue of a hollow that just ate someone. it looks really evil. Awesome... for a full size wall poster... something to consider.... great work !!!! That picture sends other verry interesting images through my mind. I'm loving the lighting and dark colouring of your fantasy art. I've actually used one as a thumb nail for a dnd campagn in fantasy grounds 2. Awsome work. And an inspiration to get off my arse and break out the oils paints again. It is one of the coolest picture I've ever seen. I think it is awesome. My friend Jose, Alan and Luis we like it.